From the producers of GET OUT & BLACKkKLANSMAN comes a raw and riotous political comedy for divisive times. A controversial White House policy turns family member against family member in The Oath, a savagely funny dark comedy about surviving life and Thanksgiving in the age of political tribalism. 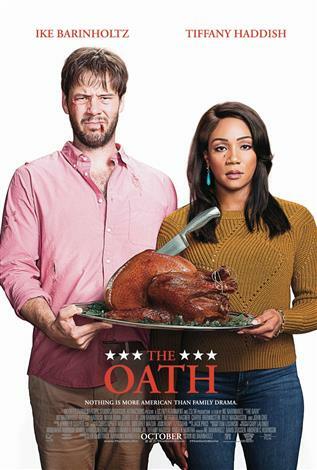 When Chris (Ike Barinholtz), a high-strung 24-hour progressive news junkie, and his more levelheaded wife Kai (Tiffany Haddish) learn that citizens are being asked to sign a loyalty oath to the President, their reaction is disbelief, followed by idealistic refusal. But as the post-Thanksgiving deadline to sign approaches, the combination of sparring relatives, Chris’s growing agitation and the unexpected arrival of two government agents (John Cho and Billy Magnussen) sends an already tense family gathering completely off the rails. As timely as it is outrageous, The Oath is a gleefully wicked sharp-witted reinvention of the traditional holiday comedy for our divisive political times.